Wait how is it pronounced?? Can you put this in my backyard, please? I saw these on Ebay and HAVE to have them! Normally I would save my weekend update for Monday but since I'll be up for at least 2 more hours (it's 12:30 AM) I figure I should just post now. 1. I FINALLY saw SATC! LOVED it. I cried (of course). I am now downloading the soundtrack off itunes. 2. I got the weirdest sunburn from my dad's softball game. I usually don't burn but I think coming from winter to summer so quickly made my skin more sensitive. You can tell exactly where the sun was hitting me: my right arm and upper thighs. Afterward we had lunch at John O'Groats. I had the best grilled cheese I have had in 6 months! 4. I start my internship tomorrow. I have no idea what to expect. Hoping I do more than just sit around and file papers! 5. I concluded I must start running again asap. At first I used my jetlag as an excuse but I can't anymore. 6. I emailed the nanny agency I have dreamed of working for. I have been seriously thinking recently about the years(s) between college (I graduate NEXT YEAR!) and grad school. Psych related internship or full time job?? Teaching (like Teach for America type program) or nanny job?? 9. I spent some quality time with my favorite little guys. I brought them back boomerangs (yes, I knew they would break everything in sight) and we tried them out at the park (I insisted we will only be using them in open places like that). Of course one got stuck in the trees so now I have to go back tomorrow and hit it out with something. Since it was my first weekend back in the states, I decided to post a photo from my first weekend in Australia. 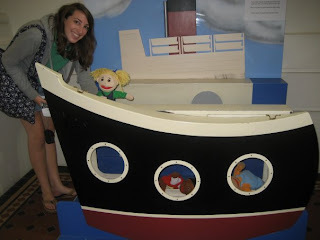 Here I am at the immigration museum. The only exciting part was this puppet show. I downloaded the soundtrack as soon as I saw the movie too! I had gone to Target to grab a copy, but they were sold out; oh the greatness of iTunes! I think you shoudl def consider being a nanny! I did some nannying with my job at first and LOVED it! The right family does make all the difference though. You will want to make sure you will be helping with the children and not raising them. I applied for TFA and am SO glad I got this job instead. In my opinion, they make it sounnd so fabulous and wonderful and it is anything but. I have had several friends do it and they have not had wonderful experiences and have pretty much been left to fend for themselves after the summer institue. However, it is a wonderful way to give back. Hope all is well in Cali, so jealous you went to Houstons as it is one of my fave places to eat! Sounds like you had a FAB week end! Love the puppet picture - your comment made me laugh out loud! I think you should try nannying too - children under 4 ARE hard work, but they are so cute and funny, and lots and lots of fun! All sounds great! Be careful taking time off in between undergrad and grad school - it's tough going back to a life with no money after a few years of a steady paycheck! *Laugh* That's coming from experience! How much was that bag? Welcome home, sounds like you've been busy! YAY! I'm so glad you got the notes! So glad you're back in LA too! YAY for LA! you are so adorable! If they have a JCrew outlet there - run!! I was just there yesterday and I found some fabulous stuff. They had an extra 40% off clearance. I agree that the whole "what to do after college" thing is driving me crazy! I will stick up for TFA and say that my older sister and her husband met during their time in TFA, absolutely loved it, it changed their lives for the better and he now has an office job in TFA. But she did have a hard time going back to grad school since she got married and had a few kids first. Anyways, I think I am going to just go ahead to grad school after next year, I'm too impatient and don't really have anything else I want to do. Nannying sounds like a fun choice for you too...hmm! Decisions decisions! I'm glad you're going to the outlets after all! As I told you there was soooo much anchor stuff at JCrew back in May so hopefully there will still be some.